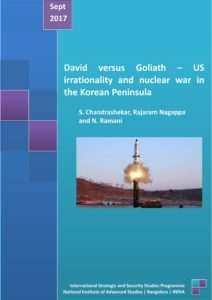 The available evidence from all the nuclear weapon and missile tests conducted by North Korea between May and September this year suggest that Kim Jong Un is no irrational madman who will resort to nuclear war for some idiosyncratic or stupid reason. Rather, each test is part of a carefully calibrated set of signals that together establish that North Korea has in place an assured retaliatory capability directed at the US and its allies in the Asia Pacific region. Accepting this reality may provide a more viable approach for realizing stability in the Korean peninsula than resorting to the shrill and often ludicrous war of words that is currently going on. S. Chandrashekar is JRD Tata Chair Professor in the International Strategic and Security Studies Programme, NIAS, Bangalore. Rajaram Nagappa is a Programme Head, International Strategic and Security Studies Programme, NIAS, Bangalore. N. Ramani is Visiting Professor in the International Strategic and Security Studies Programme, NIAS, Bangalore.